Kyle Grillot - kgrillot@shawmedia.com Jacobs junior Chris Orange (right) celebrates with his teammates after beating Dundee-Crown in the Class 4A Crystal Lake Central Regional final Friday, March 7, 2014. 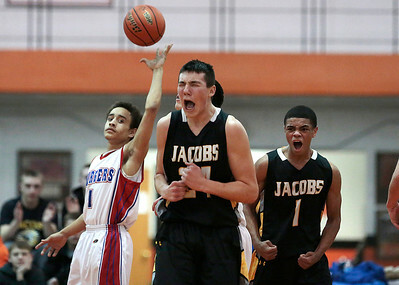 Jacobs beat Dundee-Crown, 43-33. Kyle Grillot - kgrillot@shawmedia.com Jacobs junior Chris Orange (left) dribbles around Dundee-Crown senior Zach Pochop and junior Malik Dunner (right) during the fourth quarter of the Class 4A Crystal Lake Central Regional final Friday, March 7, 2014. 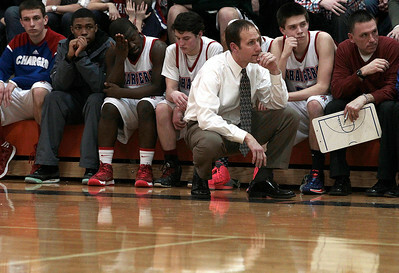 Jacobs beat Dundee-Crown, 43-33. Kyle Grillot - kgrillot@shawmedia.com Jacobs junior Kenton Mack (right) puts up a shot under pressure from Dundee-Crown senior Connor Steinmetz during the third quarter of the Class 4A Crystal Lake Central Regional final Friday, March 7, 2014. 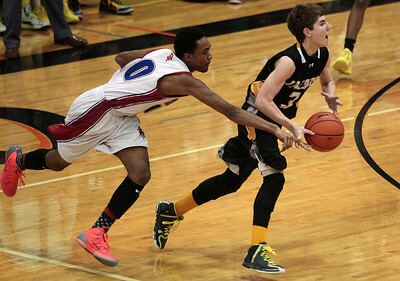 Jacobs beat Dundee-Crown, 43-33. Kyle Grillot - kgrillot@shawmedia.com Dundee-Crown senior Zach Pochop (left) watches as Jacobs freshman Cameron Krutwig (center) celebrates with junior Kenton Mack (right) after scoring a point during the second quarter of the Class 4A Crystal Lake Central Regional final Friday, March 7, 2014. 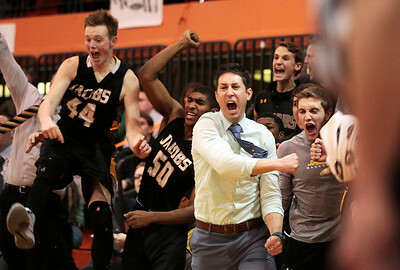 Jacobs beat Dundee-Crown, 43-33. Kyle Grillot - kgrillot@shawmedia.com Jacobs senior Reilly Peltier (left), Chris Orange (center), and Corey Boeckh celebrate after beating Dundee-Crown in the Class 4A Crystal Lake Central Regional final Friday, March 7, 2014. 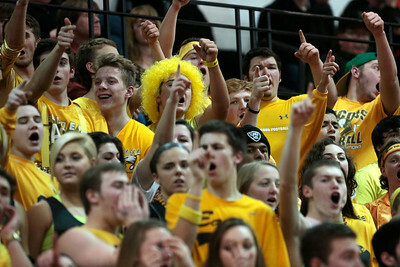 Jacobs beat Dundee-Crown, 43-33. 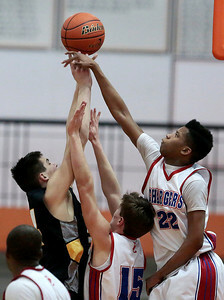 Kyle Grillot - kgrillot@shawmedia.com Jacobs freshman Cameron Krutwig (left) puts up a shot under pressure from Dundee-Crown junior Juwan Stewart (22) and senior Nick Munson (15) during the second quarter of the Class 4A Crystal Lake Central Regional final Friday, March 7, 2014. Jacobs beat Dundee-Crown, 43-33. Kyle Grillot - kgrillot@shawmedia.com Jacobs fans including senior Bret Mooney react after a referees call during the second quarter of the Class 4A Crystal Lake Central Regional final Friday, March 7, 2014. 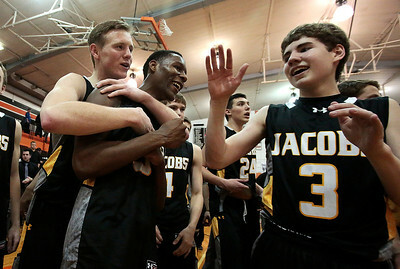 Jacobs beat Dundee-Crown, 43-33. 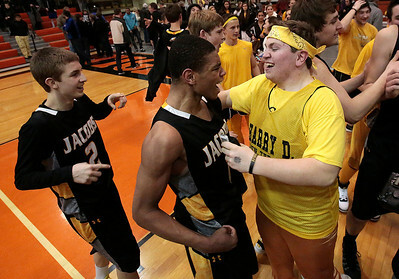 Kyle Grillot - kgrillot@shawmedia.com Jacobs junior Kenton Mack (center) and junior Kyle Wolinksi celebrate with fans after beating Dundee-Crown in the Class 4A Crystal Lake Central Regional final Friday, March 7, 2014. 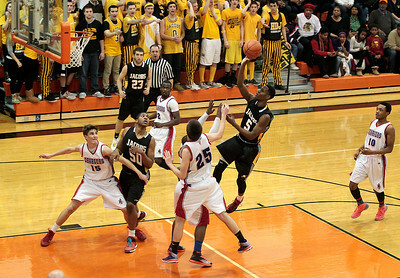 Jacobs beat Dundee-Crown, 43-33. 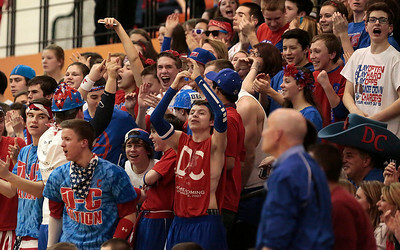 Kyle Grillot - kgrillot@shawmedia.com Dundee-Crown fans cheer after a scored point in the second quarter of the Class 4A Crystal Lake Central Regional final Friday, March 7, 2014. 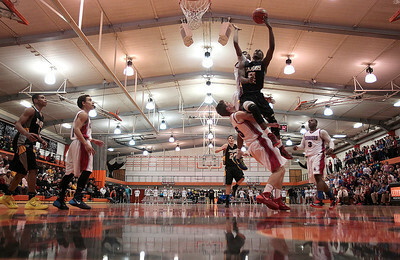 Jacobs beat Dundee-Crown, 43-33. Kyle Grillot - kgrillot@shawmedia.com The Dundee-Crown bench reacts as the game comes to a close in the fourth quarter of the Class 4A Crystal Lake Central Regional final Friday, March 7, 2014. 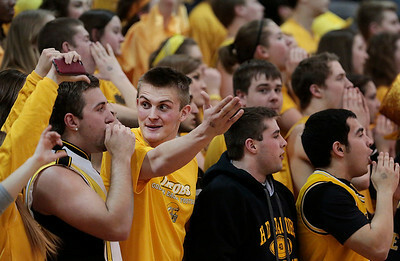 Jacobs beat Dundee-Crown, 43-33. Kyle Grillot - kgrillot@shawmedia.com Dundee-Crown junior Kiwaun Seals tips the ball from Jacobs junior Corey Boeckh during the third quarter of the Class 4A Crystal Lake Central Regional final Friday, March 7, 2014. 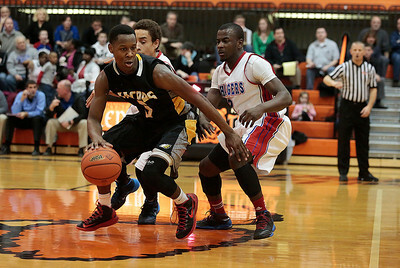 Jacobs beat Dundee-Crown, 43-33. Kyle Grillot - kgrillot@shawmedia.com Jacobs junior Chris Orange puts up a shot during the fourth quarter of the Class 4A Crystal Lake Central Regional final Friday, March 7, 2014. Jacobs beat Dundee-Crown, 43-33. Kyle Grillot - kgrillot@shawmedia.com Jacobs fans cheer after a scored point in the second quarter of the Class 4A Crystal Lake Central Regional final Friday, March 7, 2014. Jacobs beat Dundee-Crown, 43-33. Kyle Grillot - kgrillot@shawmedia.com Jacobs junior Chris Orange puts up a shot during the third quarter of the Class 4A Crystal Lake Central Regional final Friday, March 7, 2014. Jacobs beat Dundee-Crown, 43-33. 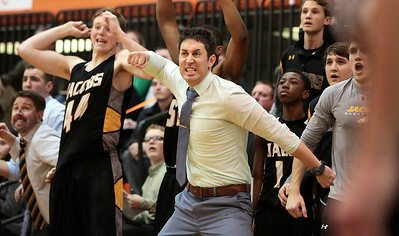 Kyle Grillot - kgrillot@shawmedia.com Jacobs head coach Jimmy Roberts cheers after a shot is made during the fourth quarter of the Class 4A Crystal Lake Central Regional final Friday, March 7, 2014. Jacobs beat Dundee-Crown, 43-33. 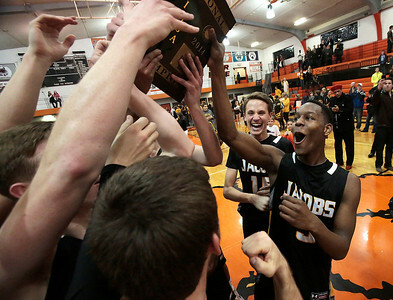 Jacobs junior Chris Orange (right) celebrates with his teammates after beating Dundee-Crown in the Class 4A Crystal Lake Central Regional final Friday, March 7, 2014. 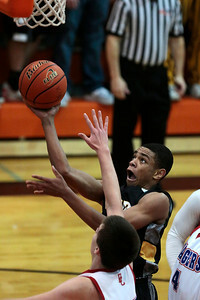 Jacobs beat Dundee-Crown, 43-33.